Mayawati "faltering": Will Rahul seek Hardik Patel-Jignesh Mevani type coalition in MP, Chhattisgarh, Rajasthan? If Narendra Modi had set the tone in late 2013 and early 2014 by unleashing a no-holds-barred attack on Sonia and Rahul Gandhi, thus inaugurating an era of personalised name-calling in politics in which every FIR led to Jawaharlal Nehru, months before crucial elections, Rahul appears to have taken aim squarely at the Prime Minister, with the available material on the Rafale deal, and the government struggling with explanations on economic fugitives like Vijay Mallya. It is clear the Congress chief is seeking to play the conscious catalyser in a likely process of crucial adjustments to the current political equilibrium in the country, depending on the outcome in the upcoming Assembly elections, which lead on to the next Lok Sabha poll. The deep-going Rafale-related suspicions of wrong-doing can be immediately stanched if the government agreed to a probe by a Joint Parliamentary Committee. It strains logic that it should reject the idea of probe – whose announcement can be in its self-interest – into suspected malfeasance involving Rs 59,000 crore of taxpayers’ money. To top these murky goings-on is the sharp deterioration in the security climate in Kashmir, which do India no credit. After the beheading of a Border Security Force (BSF) soldier on the Line of Control (LoC), the Army chief has called for a retaliatory strategy. But his words undercut defence minister Nirmala Sitharaman, who just days earlier airily informed a friendly Hindi television station that the Indians were severing the heads of the Pakistanis but were not prone to “display” – a kind of reverse of the so-called surgical strike strategy. In the national interest, all of this, besides the hardships on the economic front, would naturally lead the opposition to ask questions of the government. These may also be a factor in the forthcoming state elections. However, the overall advantage may still be presumed to lie with the ruling dispensation as it has the state machinery at its beck and call. The state can go at express speed on a propaganda blitz with the aid of the bludgeoned sections of the media, although the latter’s ability to lead the narrative is waning. Still, the regime’s opponents cannot match its propaganda resources. With enormous punitive powers at its command, the government can also arm-twist certain types of opponents into submission. This too is an advantage only the ruling party at the Centre has when it turns its back on ethics. Bahujan Samaj Party (BSP) heroine Mayawati’s falter in joining an anti-BJP coalition of opposition parties in key north Indian states, after holding out such a promise, may be cited as an example of the government’s abilities in the dark arts. Assembly polls in Rajasthan, Madhya Pradesh, Chhatisgarh and Mizoran are barely eight weeks away, and in Telangana perhaps less. In light of Mayawati’s reported moves, the Congress party has already suffered a jolt. Can the opposition’s hopes be revived? Rahul must step into the breach with an on-the-ground dynamism that he had shown in Gujarat and Karnataka. In those states Rahul gave the impression of taking on the heavy lifting himself, cutting through state factions, working on possible brackets of cooperation with various political entities, and taking an active and visible interest in settling intra-party rivalries. He also seemed unafraid of the criticism of not showing sufficient patience with certain parties and groups. This overall approach paid dividend. In the case of Madhya Pradesh and Chhatisgarh, however, the Congress stance appears to have been tentative, one born of insecurity, leading to an accent on trying overmuch to please the BSP for fear of losing out to the BJP if an alliance with the Dalit party did not come through. Mayawati, in contrast, showed panache. In Chhatisgarh, she secretly roped in Ajit Jogi while the Congress waited on her. 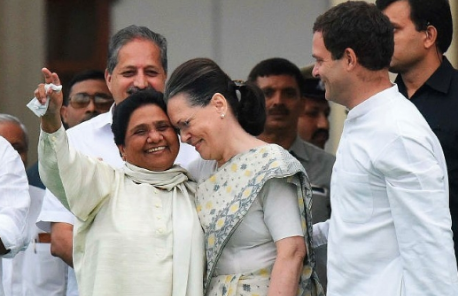 The whole episode suggests that the BSP leader has decided not to be with the principal opponents of the regime in any state, including Uttar Pradesh (UP). In the circumstances, Mayawati’s interlocutors, especially the Congress, can only survive by displaying boldness, which since Indira Gandhi has not been the party’s dominant characteristic. This calls for a barn-storming mindset -- to campaign vigorously with the Dalit communities, for whose youth the BJP has been an object of anger in recent times. Mayawati is losing sight of the fact that young Dalits, in UP especially, had gone to the BJP in droves in 2014, and not to her, and this time around they might be looking for a third option in case she pitched in with the BJP. In a scenario of this kind, attempting the Hardik Patel-Jignesh Mevani coordinate adopted last year in Gujarat suggests itself. These young, radical politicians of different persuasions had borne an unusual political responsibility by going against set patterns and had paired with the Congress. Such young politicians need to be unearthed in the northern part of the country as well. The reliance on compromised politicians in general, including within the Congress, when taking on entrenched communal tendencies, can hardly be overstated. In a quarter century, for various reasons, the Congress has not been the preferred destination of the youth, who now seem to have gone off on communal or caste tangents in the main, with the communal call being the louder. This, however, brought them nothing but misery. Narrow identity-based ideologies rooted in the far right are known to produce economic despair, especially for the middle and the poor classes, and bring about deep social cleavages and insecurities. This was the scenario in which Gujarat had made a move toward the Congress last year. In Gujarat, for the youth, Congress was the only probable alternative; and two, it had a new, energetic, young, leader in Rahul who looks sincere, if too earnest, and appears not corrupt. The latter was decidedly a factor. Earlier, Congress had been a probable alternative, but without making a difference. When Modi and Rahul are now head-to-head, the former is not an automatic choice any more. That’s been clear for some time, as recent polling data also attests. With the country’s woes mounting, and despair seizing the youth, this is not an unnatural outcome. But the Congress, especially, must remember it is starting with a very narrow base. Regime criticism alone cannot do the trick. Creative collaborations are vital. Rajasthan, Madhya Pradesh and Chhatisgarh, in each of which the RSS-BJP are in power, the Congress can only make headway if it shows tactical innovativeness and awareness, and pitches its appeal across all sections, not least because all have borne the brunt, although some more than others. In this terrain lies the Congress’ real challenge. *Senior journalist, based in New Delhi. A version of this article first appeared in the "The Asian Age"